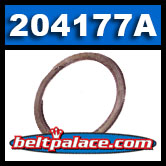 Comet 204177A - CAT-99/TC-88 Retaining Ring for Driven units. Comet 204177A - SINGLE PACK. CAT-99/TC-88 replacement retaining ring for Driven units. Genuine Comet Industries 204177-A Part.